Arguably one of the most important components in PC gaming is the mouse. 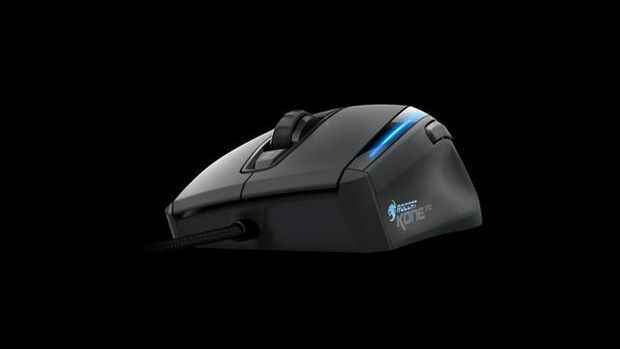 To play at your max, you've got to have the precision and control for your favorite first-person shooter, MMO, or whatever game you play, so it only makes sense to have a kickass mouse, right? 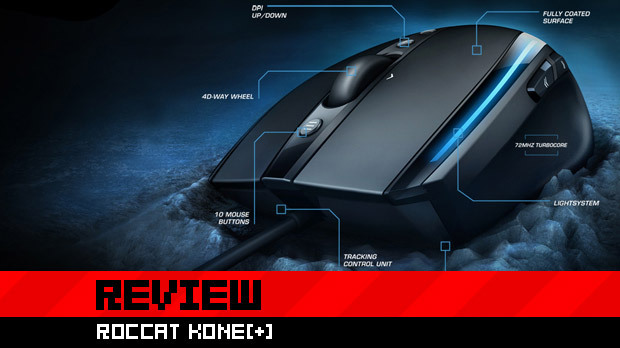 From the start, the ROCCAT Kone[+] seems to suit that need by offering high-quality hardware and drivers, but it seems to lack in the reliability department. 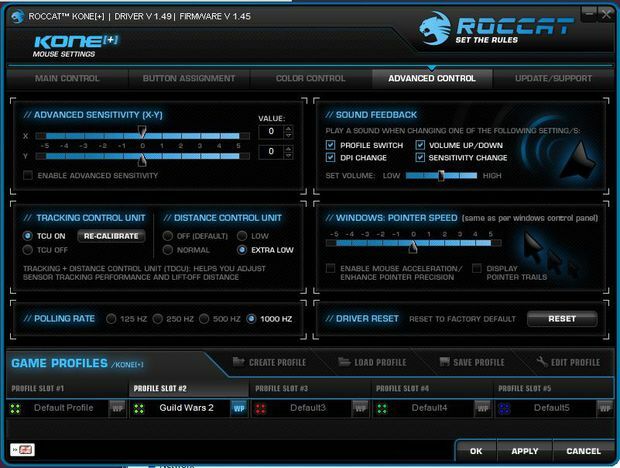 Here are the specs for the ROCCAT Kone[+]. For the purposes of this review, I will just call the Kone[+] the Kone, as I'm going to get tired of typing [+] over and over. Yes, I know there's a regular Kone -- let's pretend there's not. Right off the bat, you can tell the Kone is a pretty sweet mouse. The four LEDs create two "lanes" that flash through all the colors by default, creating a cool effect. The mouse itself is a bit on the larger side, but not so large that it becomes cumbersome. The scroll wheel was quite a bit stiffer than my Logitech G500, but it wasn't a problem as I got used to the mouse on the whole. 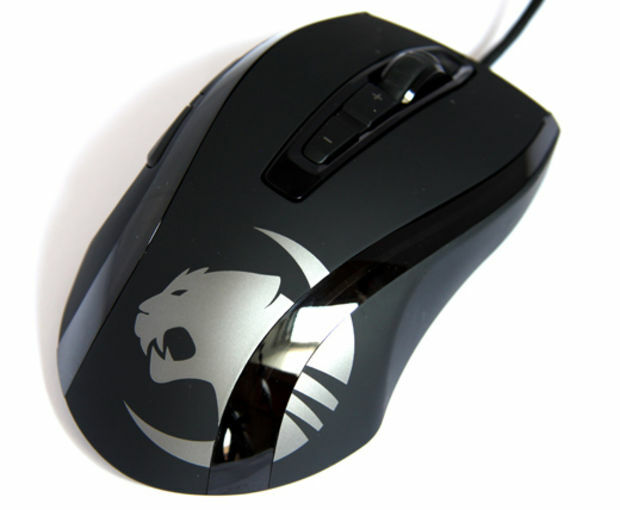 Appearance-wise, the Kone is a matte black with the ROCCAT logo in silver on the back end of the mouse, with the two "color lanes" down the sides. Unlike the Razer Naga, this mouse only has the basic buttons (whether that's good or bad for you), but comes equipped with a technology called EasyShift, which we'll cover a bit more later in the review. For general use, just like most other gaming mice, you aren't going to see or feel anything special about this mouse other than the pretty lights. The clicking is a bit stiffer than I was used to coming from the G500 I had before, but not by much. The mouse itself is rather quiet, as it comes with low-friction mouse feet. Compared to other mice I've used previously, it makes some noise, but not quite as much, which is is impressive because I use the Titan aluminum mouse pad and that tends to create noise no matter which mouse you're using. The Kone actually is a little taller than most mice I've used; my pinky finger doesn't drag on the mouse pad as a result, which makes use of the peripheral a pleasurable experience. The 5g weights the mouse comes with are extremely handy. When I first got the mouse, I found that I didn't like that it seemed too front heavy, but a couple of the 5g weights easily balanced it out and now when I pick up the mouse for something, it doesn't tip forward. 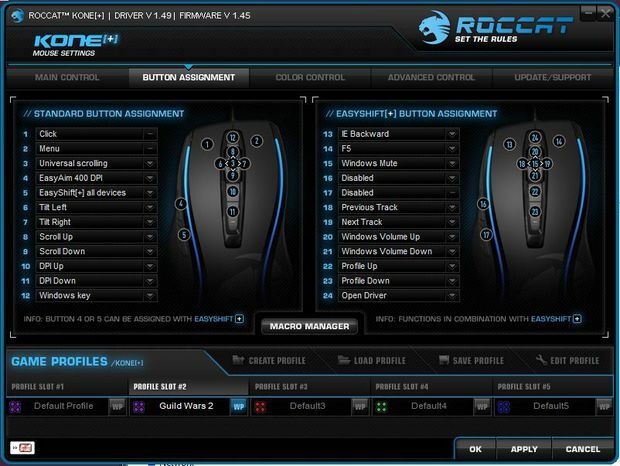 Just like the ROCCAT Isku I reviewed earlier, the Kone comes with excellent driver software, which allows you to customize almost anything about the mouse. The first tab houses the main control of the mouse, where you can adjust the sensitivity, vertical and horizontal scroll speed, and the DPI settings of five different levels. The second tab deals with button assignment and the EasyShift function we talked about before. Not only can you customize every button on the mouse, but you can also use the EasyShift button (either the forward or backward button on the left side of the mouse) to change the function of the buttons to anything else you might want. Along with EasyShift, there are also two functions called EasyWheel and EasyAim. EasyWheel essentially allows you to change a variety of things by pressing the EasyWheel button and scrolling through your five DPI profiles. EasyAim, on the other hand -- my favorite function of the three -- allows you to press the button and temporarily change the DPI of your mouse to, let's say, 400 DPI when you go in to snipe someone or something along those lines. Then all you have to do to go back to normal is release the button -- pretty useful, right? 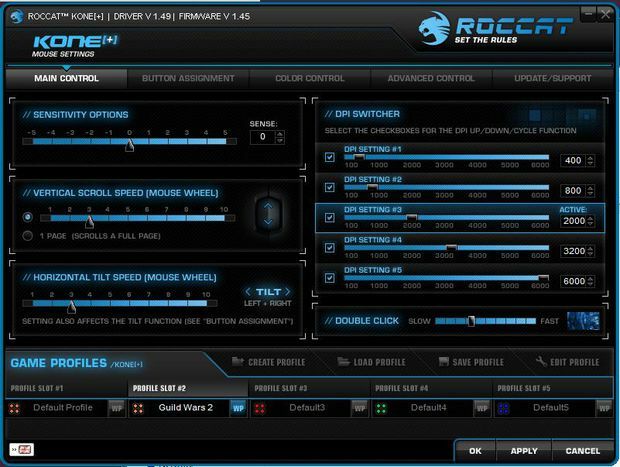 Paired with the ROCCAT Isku, the Kone has a unique feature called ROCCAT Talk. This feature allows the Isku and the Kone to communicate with each other using the EasyShift function. So if you were to press the EasyShift key on the Isku keyboard, it would activate EasyShift on the Kone as well. This includes activating the EasyAim system mentioned before (though it's not directly paired with EasyShift, so you can assign EasyAim to a separate key if you want). Next up is the control panel for the "color lanes" I mentioned earlier. The Kone is able to be adjusted such that both the lighting effect and the direction of the lights are both able to be changed along with picking the color family you want each of the four lights to have. For each of the lights, you pick one color, and the Kone flashes through all related colors within that range. The advanced control comes with some terrific features, if I do say so myself. The first is the X Y sensitivity. If you want your horizontal movements to be registered more than the vertical, you can do that or whatever combination of the two you prefer. The Kone also comes with sound feedback, which says what you changed your settings to whenever you change them using the mouse buttons. It can get kind of annoying sometimes, so I usually end up turning the voice overs off when I change settings on the fly a lot. The next three are pretty standard. There's the Windows pointer speed, which is more or less a shortcut to the mouse control panel built into Windows, polling rate, and a driver reset. Saving the best for last, the Kone has two features which really make the mouse for me. I always get frustrated whenever I pick up a mouse to readjust my hand and find my cursor on the other side of the screen. The Kone's distance control eliminates that problem completely. 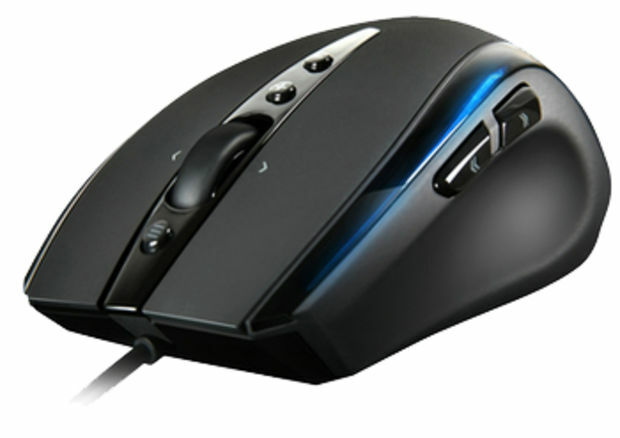 In addition to that, the Kone is able to optimize itself to your mouse pad, allowing for greater precision. It's a noticeable change in that with the TCU off, I could see the mouse flickering a little bit when I moved it slowly. With the TCU enabled, I have no problems whatsoever. 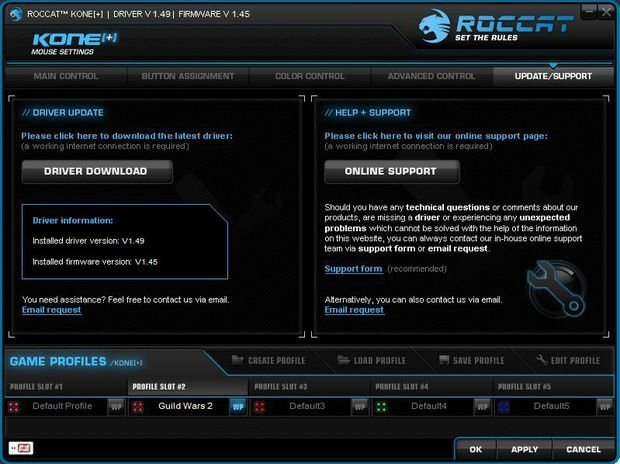 Remaining is the update tab, which just allows you to download the current driver and access to help support. Nice to have, but redundant -- it just points you to their website. Below all the tabs are the profiles, just like the Isku had. I'm sure you can figure it out for yourself, but you can store five different sets of settings for the mouse, all of which are stored in the on-board memory of the device; it's an excellent feature that I wish more mice had. Although this mouse is amazing, I did find that it had some minor reliability problems. During the review process, I actually went through two Kones. The first I had sent back because it wouldn't register the scroll wheel moving sometimes, which became a serious issue. ROCCAT has said that this is an isolated problem, but through some research, it seems as though it's not as isolated as they may have liked. That being said, the replacement mouse they sent me has not experienced this problem at all. The second problem has occurred in both mice, however, it's not as big of an issue in my opinion. Occasionally, the cursor will fly over to the very right side of the screen, which can be mildly annoying, even causing a pretty bad miss-click in some cases. The Kone is an excellent mouse with the exception of its minor flaws. The software the Kone comes with is one of the best programs I've seen for a mouse, and is able to be customized in almost any way. 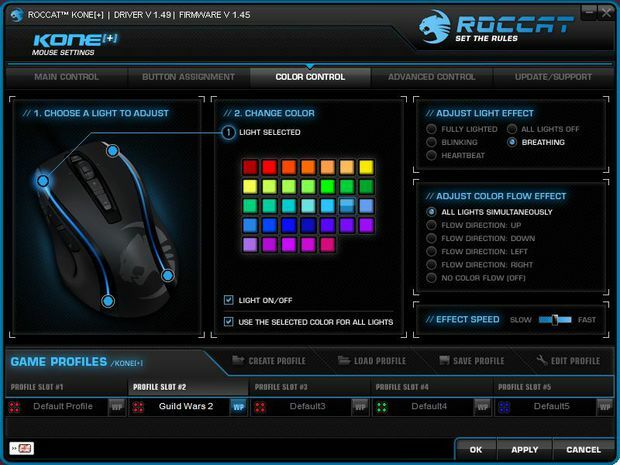 Combined with the two-year warranty that comes with every ROCCAT product, I feel the mouse is definitely something I would buy again. 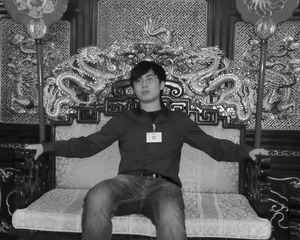 ROCCAT Talk, on the other hand, is another story. Considering that both the Isku and Kone are excellent products, I recommend them both separately. However, it's not worth having both just so they can communicate with each other via EasyShift simply because while it's a good idea in theory, I found I rarely used the functionality.